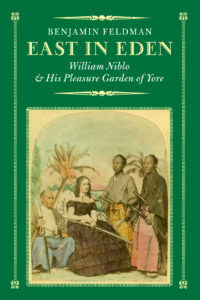 William Niblo, an Irish immigrant to New York City at the end of the 18th century, rose from his initial position in the hostelry and tavern business in Lower Manhattan to found an immensely popular “coffee house,” and then opened an enormous pleasure garden in the London tradition at the northern limits of the populated City in 1828. Initially mostly an outdoor place of leisurely entertainment and recreation of middle class New Yorkers who eschewed the use of few crowded and noisy public parks, Niblo’s Garden expanded and improved many times over its 66-year existence, always under the name of its founder. Niblo’s name and good will were known all over the United States, and his stages were sought after by performers of all ills for opera, circus acrobatics, equeststrian displays and grand private celebrations. The story of this devout Episcopalian’s rise in New York through the 19th century with his wife Martha King Niblo at his side forms a remarkable chapter in the story of public, genteel, urban entertainment in Victorian times. Benjamin Feldman has lived and worked in New York City since 1969. His essays and book reviews about New York City, American history, and Yiddish culture have appeared online and in print in CUNY’s Gotham History Blotter, The New Partisan Review, Columbia County History and Heritage, and Ducts literary magazine.